An avid reader and writer since she was a child, Jessica Renwick inspires with tales of adventures about friendship, courage and being true to yourself. She is the author of The Book of Chaos, the first book in a fantasy series for middle grade children. She enjoys a good cup of coffee or tea, gardening, her pets, consuming an entire novel in one sitting, and her own outdoor adventures. She resides in Alberta, Canada on a cozy urban homestead with her partner, tiny monster dog, four chickens, and an enchanted garden. Fable Nuthatch lives a quiet, safe life in the village of Larkmoor, full of simple people leading normal lives. There is no magic here. None except for the spark that runs through Fable’s veins. She is different than the others here. Living under the roof of her over-protective aunt, her magic is kept secret, hidden inside the walls of their cottage. When a strange book lands in Fable’s lap, and her cousin disappears into its pages, she follows, hurtling into an enchanted forest far from the rolling hills of her home. This is a land filled with strange people, magic and more danger than Fable has ever dreamed of. After their escape from Endora’s mansion, Fable Nuthatch and her friends are recovering at Tulip Manor. With Fedilmid and Aunt Moira’s protection spells keeping them safe, the children have settled into a routine life of friendship, studying, and practicing magic. When odd messages appear in Fable’s book, and a strange light in the forest rouses her dog’s curiosity, the children’s lives are spun back into mayhem. 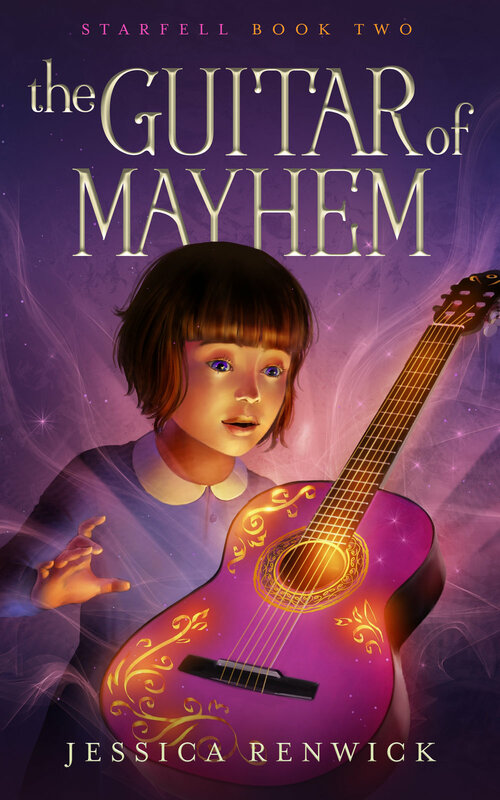 A trip into the magical city of Mistford leads them on a wild chase after a rogue star, a missing astronomer, and an enchanted guitar that holds a secret that will change their lives forever. With Endora hot on their trail, can Fable and her friends discover the truth before its too late? Join me at the Indigo Chapters, South Edmonton Common location on Saturday, May 11th.. I will be there from 11:00 am - 4:00 pm signing books and chatting with readers. Get your signed copy of The Book of Chaos, or bring in your copy to have it signed! Join me at Owl’s Nest Books, Calgary’s oldest independent book store, on Saturday, June 8th. I will be there from 11:00 am - 2:00 pm to sign books and visit with readers. Books will be available for purchase. I look forward to meeting Calgary readers! I love visiting schools, libraries and doing readings at other events as well. If you are interested in hosting an author visit please e-mail me at the link below for more information. Please visit my GoodReads author page to read more reviews!